Richard Goldstone, Chas Freeman, Shirley Sherrod. If you figure ‘Shirley” as a nickname for a first baseman, “Freeman to Goldstone to Sherrod” could be a modern day version of the celebrated double play Chicago Cubs’ combination of “Tinkers to Evers to Chance”. It could even be a prestigious law firm on LaSalle Street in Obama’s hometown of Chicago. It is neither. It is, rather, a series of events that has produced an 18-month nightmare for Barack Obama. “Freeman to Goldstone to Sherrod”, is a Washington disaster, an accumulation of three major presidential stumbles, each of which could easily have been avoided. What they have in common is poor staff work and a president overly sensitive to political calculations. The main stream media (MSM) played a major role in helping to enable these stumbles. It did so by going for the quick and shallow headline and analysis that now permeates the 24-7 news cycle. Two of these major stumbles involve Israel, which means the MSM did nothing to probe beneath the prevailing conventional wisdom that would have cut through pro-Israel bias and asked harder questions as to what really was happening in these two stumbles. The Israeli media did a far better job of reporting on the Freeman and Goldstone stumbles than did any MSM outlet in the US. It was not because of ignorance that the US media failed to cover Freeman and Goldstone. The internet brings the Israeli and Arab media into every newsroom of every media outlet in the US. The story was there, but the media is a part of the alliance of the pro-Israel MSM media and American politics that protect the White House from having to face the unpopular truth about Israel. That is why it is called “enabling”. The Sherrod stumble, however, involves race, which the MSM jumped on with vigor, once its initial part in pushing a false story was exposed by some simple research. This stumble is the third in the “Freeman to Goldstone to Sherrod” series, but since it is the most recent stumble, it is better known than the other two. Because the MSM has a shared belief in matters racial, the MSM quickly filled in details of the Sherrod affair and brought the distortions to the public’s attention. The MSM reversal also brought an immediate apology from President Obama and his personal request that Sherrod “stay in” government service. The call, however, did not come until it became obvious that she had been grossly maligned. This third White House stumble should have been an easy call for an African American president. Instead, for reasons as yet unclear, President Obama did nothing to prevent the initial White House attack on Sherrod. There is a common thread that connects these three Obama stumbles, “Freeman to Goldstone to Sherrod”: Atrociously bad staff advice driven by cold calculating politics, and the failure of President Obama to overrule bad advice and declare, firmly: We will do the right thing. The right thing in the matter of Shirley Sherrod was to forget about the 24-7 news cycle and not worry that Glenn Beck will run with the story while the White House pauses to check it out. Later, much too late, check it out is exactly what the White House finally did. This story began on Monday, July 19. 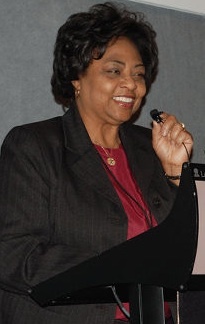 Sherrod was driving her car from Columbus, Georgia to Athens, Georgia, when she received a message that the White House wanted her to resign her position as the Georgia director of the US Department of Agriculture office of Rural Development. The controversy began after several media organizations posted a 38-second video clip of Sherrod speaking to a local Georgia chapter of the NAACP. She tells the group that she did not give a white farmer “the full force of what I could do” after he asked for assistance. The video surfaced days after the NAACP quarreled with Tea Party members over allegations of racism. Sherrod said her statements were taken out of context. “My point in telling that story is that working with him helped me to see that it wasn’t a black and white issue,” she said. Sherrod added that the episode took place in 1986 before she worked for the Agriculture Department. Sherrod said that she eventually became friends with the farmer and worked with him for two years to help him avoid foreclosure. How could the first African American president allow this to happen? Maureen Dowd’s New York Times column offers a simple explanation of how the Sherrod stumble could have been avoided. The Obama White House is too white. It has Barack Obama, raised in the Hawaiian hood and Indonesia, and Valerie Jarrett, who spent her early years in Iran. The first black president should expand beyond his campaign security blanket, the smug cordon of overprotective white guys surrounding him. . . . Otherwise, this administration will keep tripping over race rather than inspiring on race. As Lewis, the longtime Georgia congressman, told The Atlanta Journal-Constitution, he knew immediately that something was amiss with the distorted video clip of Sherrod talking to the NAACP. The firing of Chas Freeman was the first White House stumble in President Obama’s 18 month nightmare. It is also one that President Obama has refused to acknowledge. One reason: His White House “white guys” are as fixed on the Israeli side of the Israel-Palestine issue as they are trapped in their whiteness in advising the President on racial matters. Besides, the MSM makes no effort to understand the Palestinian side of the issue; hence no pressure from the media. The first of his series of blunders began when, in late February, 2009, Obama appointed the veteran diplomat Chas Freeman to serve as Chairman of the National Intelligence Council (NIC). Ambassador Freeman came highly recommended, but he was also on record as having committed the Number One Washington Sin in all matters Israeli. He had uttered public criticism of actions by the Jewish state. His appointment evoked an all-out smear attack which has become common place in US right wing media. It was McCarthyism at its worst. Freeman’s post was too far down the food chain to require Senate approval, but the right wing noise machine put together attacks from politicians and pundits to force the president to withdraw Freeman’s name on March 11, 2009. Much credit for the success of the Freeman smear campaign goes to a well known Senate PEP (Progressive Except on Palestine), New York’s Charles Schumer. Schumer called his White House friend Rahm Emanuel, with clear instructions: The Freeman appointment must not stand. On his blog, Informed Comment, Juan Cole has a detailed analysis of how Freeman was named and then dropped. It is must reading. The second major stumble in the “Freeman to Goldstone to Sherrod” series quickly followed the Freeman Affair. It was the mishandling of the Goldstone Report by the White House, a huge mistake since it was clear that the evidence discovered by Goldstone would eventually be shown to be valid. Obama has refused to acknowledge that he was wrong to reject the Goldstone Report, which was researched and written by a committee headed by Judge Goldstone. The Goldstone committee was asked by UN Secretary General Ban Ki-moon to investigate possible war crimes and crimes against humanity during Israel’s December 2008-January 2009 blitz against Gaza which claimed nearly 1400 Palestinian lives. This invasion of Gaza took place during the final days of the George W. Bush presidency, ending on the eve of President Obama’s inauguration. In the face of world-wide support for the UN Goldstone Report, President Obama worked to squash the Goldstone Report, sending it off to bureaucratic oblivion rather than have Israel suffer further exposure for its conduct in the January 2008-2009 invasion. Writing in the South African publication, Business Day, Allister Sparks reports that the Israeli military’s own investigation has been completed, with results that vindicate much of the Goldstone Report. After carrying out its own investigation into last year’s Gaza War, the Israeli military has finally confirmed several of the most serious incidents committed by its troops in that 22-day assault, which a United Nations commission of inquiry, headed by our own Judge Richard Goldstone, reported on last September. In a low-key report released two weeks ago that seems to have escaped the attention of the entire South African media, perhaps because of its preoccupation with the Fifa World Cup at the time, the military has confirmed that three of the most serious findings of Goldstone’s egregiously vilified report were true. It has confirmed the fatal shooting by a marksman of an unarmed man (the Goldstone Commission said a man and a woman were killed) walking with a group of Palestinians waving a white “surrender” flag; the shelling of a mosque during a prayer service, causing casualties among the worshippers; and the ordering of a criminal investigation into a fatal air strike on a house where about 100 members of an extended Palestinian family, the Samounis, were sheltering on the advice of the Israeli Defence Force. The Samouni case caused particular outrage worldwide because Israeli forces prevented Palestinian paramedics from entering the house for days after the strike. When Red Cross workers eventually got into the house, they found four emaciated Samouni children, who had been trapped there for days with their mothers’ corpses. In all, 30 Samounis died. The great, strongly anti-Apartheid South African journalist Allister Sparks has penned a powerful rebuke of his country’s Chief Rabbi, Warren Goldstein, over the latter’s strongly expressed criticism of Constitutional Court member Richard Goldstone, and Goldstone’s role in heading the UN’s fact-finding mission for Gaza. Sparks starts by noting that three of the major IDF war crimes reported by the Goldstone Commission in Gaza were in fact recently confirmed to have been such by a military investigation undertaken by the IDF high command itself. His critics were [supported] by Chief Rabbi Warren Goldstein, who chastised Goldstone for “doing great damage to the state of Israel”. He should have recused himself instead, Goldstein said, and taken no part in the investigating mission. We secularists need to know what a religious leader in our community means when he seeks to impose such an ethical dictum on a prominent member of his faith [Judge Richard Goldstone] — someone who was a founding father of our Constitutional Court and an interpreter of our infinitely important national constitution in this new democracy. This entry was posted in Media, Middle East Politics, Religion and politics, The Human Condition. Bookmark the permalink.